Shalimar Indian Curries uses their own specialised couriers to deliver their food. Fried homemade pyramid pastry filled with spicy vegetables. Spicy lamb cutlets covered in homemade pyramid pastry. Gram flour, mix assorted vegetable dipped in butter and deep fried, served with mint sauce. Deep fried dish of onions mixed in gram flour batter along with mild spices. Deep fried dish of "paneer" mixed with gram flour batter and spices. Chicken marinated overnight in yoghurt, lemon, spices and barbecued in "tandoor". Prawns marinated overnight in yoghurt, lemon, spices and barbecued in "tandoor". Boneless fish deep fried with batter. Served with mint sauce. Deep fried boneless chicken marinated in spices and then cooked in a pan with chilli and onions. Dish of "paneer" mixed with gram flour batter and spices. Barbecued in oven. Cottage cheese stir-fried and flavored with soy sauce, tomato, diced onion and capsicum. Tender chicken marinated with yoghurt, garlic, ginger and cashew nut cooked in tandoori oven. Boneless chicken marinated overnight in yoghurt, spices and lemon. Barbecued in oven. Tender fillet fish pieces marinated in spices and roasted in tandoori oven. Kebabs made from minced mutton and chicken meat. Mixture of Samosa, Murgh Tikka, Vegetable Pakora and Seekh Kebab. Tender boneless pieces of meat cooked in delicious crushed mango sauce. Goat pieces with on bone cooked in inions, tomatoes and fresh herbs in a traditional special method. Boiled cauliflower and potatoes cooked in spicy onions and tomato sauce. Boiled potatoes cooked in cumin seeds with clarified butter. Mixed vegetables cooked in tomato sauce. Spinach cooked in cream sauce and homemade cheese. Mixed lentils simmered over a slow fire and treated in "ghee'. Mixed vegetables cooked in cashew and almond sauce. Fresh homemade cheese cooked in butter, cream and green peas. Spinach and potatoes cooked in cream sauce and homemade cheese. Mixed lentils cooked in spices and onion tomato gravy. Deep fried cottage cheese, potato and spices rolled and cooked in cashew gravy. Seasonal vegetable cooked in herbs and spices and rich butter sauce. Chick peas cooked in a masala sauce with garlic cumin and fresh coriander. Cottage cheese cooked in onions in cashew gravy. Cottage cheese cooked with capsicum, onion, chilli, coriander seeds, tomato and onion ,masala sauce. Fish cooked in tangy tamarind sauce with curry leaves. Fish curry with coconut milk and curry leaves. Fresh fish pieces cooked in onion gravy, potatoes and hot vindaloo sauce. King prawn cooked in rich tomato and butter sauce. Prawns cooked in fresh black peppercorn. Tiger prawns soaked in onions, capsicum and tomatoes. Prawns cooked with coconut milk and curry leaves. Prawns cooked in cashews and almonds. Tender cubes of beef cooked in "ajwain" and pepper. Beef pieces cooked in semi-crushed pepper, onions and tomato sauce. Cubes of beef cooked in cream, cashews and almond sauce. Beef cooked in red dry chilli sauce with onions and tomatoes. Beef cooked in coconut and tamarind flavoured sauce. Beef cooked in a tangy, sharp, hot and spicy sauce. Chicken cooked in coconut and tamarind flavoured sauce. Chicken cooked in a tangy, sharp, hot and spicy sauce. Boneless chicken pieces cooked with fresh spinach and onion gravy. Fresh mushroom, tender chicken pieces cooked with garlic, tomato and onion gravy. Boneless tandoori chicken cooked in spices. Chicken cooked in green chilli sauce. Chicken marinated in onions and spices. Cooked and served. Chicken cooked in cream, cashews and almond sauce. 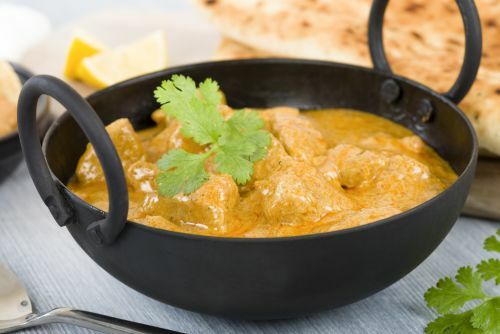 Boneless tandoori chicken cooked in butter and cream sauce. Lamb cooked with onions, tomato and spicy sauce. Tender lamb cubes marinated in onions and spices. Cooked and served. Cubes of lamb cooked in cream, cashews and almond sauce. Lamb cooked in spiced puree of spinach. Lamb cooked in a tangy, sharp, hot and spicy sauce. Rice cooked with a light touch of Indian herbs. Aromatic basmati rice cooked with vegetables. Aromatic basmati rice cooked with chicken or lamb meat and prawn. A choice of chilli or mango or lime or mixed. Traditional Indian flatbread made out of plain flour and baked in tandoor. Butter folded through the flatbread enriched with yoghurt. Traditional Indian flatbread topped with garlic and fresh coriander. Freshly made naan stuffed with spiced dried fruits and nuts. Freshly made Indian naan filled with minced lamb, ginger, coriander and spices baked in tandoor. Plain naan filled with cheese and baked in tandoor. A crispy multilayered wholemeal flatbread is a result of dough combined with ghee, coiled, folded and baked in tandoor. Freshly made naan stuffed with spices, mashed potatoes or cottage traditional Indian cheese. Homemade cottage cheese dumpling in sweet syrup.